The NURail Center sponsors conferences that promote the scope and focus of its objectives. Joint Rail Conference (JRC) - JRC is the major, multidisciplinary North American railroad conference encompassing all aspects of rail transportation and engineering research. NURail consortium partners routinely send participants to this conference to both give and attend presentations. Click here for the link to the JRC 2016 - NURail Presentation Abstracts. International Crosstie and Fastening System Symposium – The primary objective of this symposium is to facilitate the transfer of technology and knowledge as well as to further domestic and international communication and collaboration on the design and performance challenges and solutions for crossties and fastening systems. This three day conference will have presentations, discussions, and a technical tour that focus on the state of the art in timber, concrete, steel, and composite crosstie and fastening system design, performance, research, modeling, and inspection. Click here for more information. This premiere annual conference is an excellent forum for exchange of information on current methods and practices employed by the Rail industry and their consultants to address current and on-going environmental issues, learn about new techniques and technologies, and generally stay in touch with the direction of the railroad industry’s environmental programs. Click here for more information. 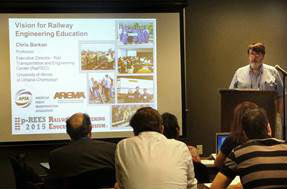 Railway Engineering Education Symposium (REES) - The objective of this symposium is to further inform the professors about current research and development in railroad engineering education programs and give them materials to educate students about railway infrastructure, performance, engineering, and design at their respective universities. To listen to Dr. Leslie McCarthy, Associate Professor with the Department of Civil and Environmental Engineering at Villanova University, talk about her experience with REES, click here. 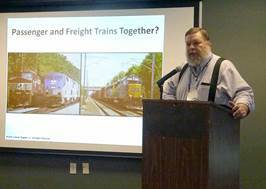 Conrad Ruppert, Jr. addresses the audience at the first p-REES hosted by the Southeastern Pennsylvania Transportation Authority. Chris Barkan talks to more than 50 industry professionals and college and university professors during the three day event. 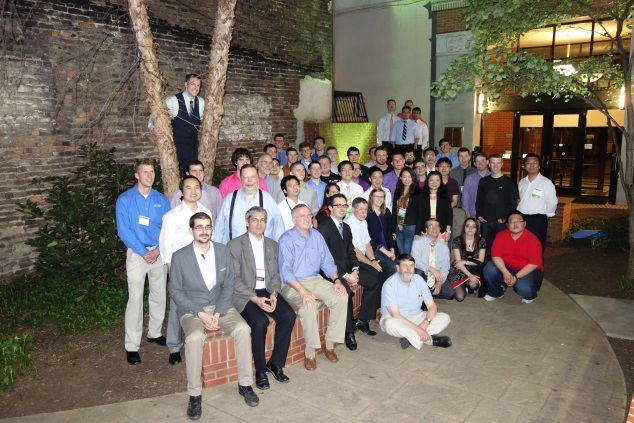 Professors from around the country attended the Railway Engineering Education Symposium (REES) on June 23 – 25, 2014 in Overland Park, Kansas. 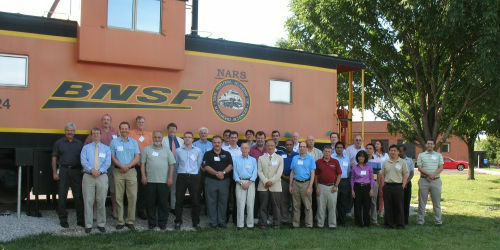 Attendees of the 2012 Railway Engineering Education Symposium. The objective of the symposium was to further inform the professors of the workforce crisis and give them materials to educate students about railway infrastructure, performance, engineering, and design at their respective universities. 2014 Global Level Crossing Safety and Trespass Symposium -GLXS 2014 was the principal international conference bringing together engineering, safety, security, human factors, practitioners, academics and researchers from the global highway, rail, law enforcement, research and regulatory communities. Listen to Reg Souleyrette as he discusses the emerging issues surrounding rail grade crossings.